The year 2015 has the potential to bring incredible opportunity to businesses across the globe. Over the past month, there have been many predictions about what the new year will hold, and one common thread is the thought that our complex world can be made simple. Many talk about technology and automation, software integrations and cloud computing, and simplifying complex processes. Simple sounds good, right? 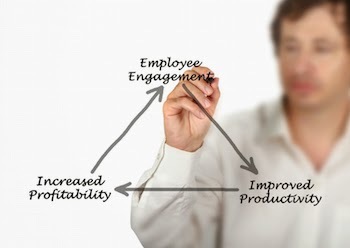 But when it comes to engaging employees, simple is not the word that may come to mind. Most of us, if asked, could come up with a list of behaviors we would like to see from our employees, and a list of behaviors we do not want to see. Engaging our teams begins with understanding that what we wish for is really just simple behavior change. After all, to us, it's not rocket science; Am I right? We want our employees to show up every day, be productive, be safe at work, take care of their own well-being, be mindful and present at work, and to measurably move the needle for us. The dramatic increase in profitability and productivity alone has the power to transform companies into high performance mode. And the KPIs measured in the Gallup study indicate that we have the potential to catalyze behavior change … and it's really not that hard. To help you understand what it takes to see these kinds of changes within your organization, the CA Short Company wrote The 7 NEW Rules of Employee Engagement. As you can see below, it all begins with creating a culture of engagement through recognition. Culture: Create a culture of recognition that resonates through all aspects of the organization. Incorporate formal, informal, & day-to-day recognition into the strategic recognition platform. Resources: Empower employees to develop new skills and advance their careers. Reward those employees who use those opportunities to learn and improve. Communication: Consistently communicate and live your organization’s values & vision. Recognize those employees who impact the quality of the organization’s work, products, and services. Appreciation: Value your employees and their ideas. Recognize employees for providing input and for taking initiative outside of their daily responsibilities. Well-being: Promote work-life integration. Recognize employees who make positive & healthy lifestyle changes that improve the quality of life. Enthusiasm: Inspire enthusiastic performances from your employees. Reward employees who show commitment to the future of your organization and are dedicated to making it a success. Safety: Encourage employees to work both efficiently and safely. Recognize those employees who maintain a safe and healthy working environment for themselves and others. At the C.A. Short Company, the prediction for 2015 is that engaged teams will emerge and carry their companies to be among top performers. Easy? Not necessarily. Worth it? In spades. That's why they've built an innovative recognition platform that they're bringing to the market, based on the 7 New Rules of Employee Engagement. To request a private beta demo, contact curtd@rcbawards.com. Let us know your thoughts - we'd love to hear your ideas about additional ways to engage employees in order to create high-performance teams.